wAive, by Plaid Notion. Comments, please. Oh, and scroll down for some old screenies. I'll add the new ones shortly. Unfortunately we only had time to finish one level, but trust me. It's fun. Arcade mode was tweaked for ease and the tutorial was revamped. Also a lot of new, nice graphical touches were added. I suggest highly that you do the tutorial. Also give both play modes a try. Look jellyf15h, not only do I welcome you to the Shmup-dev forums ( ! ), but also to this newest competition as well!! The theme of this new compo will not be revealed until June 1st here, but I gotta promise you one thing... it will be A LOT more exciting than ever!!! ! Be sure not to miss it all, and you are accepted into the contest, by the way. Just be sure to put the name of your newest game entry... remember that now! Wonderful, as it is *truly* a good thing in this case to have such talented artists to help you on your new project, you know what I am saying? And yes, your team is allowed to help you work on your game and piece the elements of it together... even if you prefer to do it that way as well. Hoory, I'm excited! We have a wide-open theme with capability for massive fun! Yo jellyf15h, is that(your avatar) animated ASCII?! Wow! It's just a recording of a semicircle and some simulated rope physics. It's stretched way down too, so try viewing the whole thing via its URL. ERGH sorry for the double-post, but I'm not sure which language I'll be programming this in. Might be in GM, Java or C++. My question to you: are java applets OK? It's a definite maybe for me. Yes, but just as with Flash entries though, you'll need to provide it as a standalone. Then write your launch script to use the applet viewer. This is, of course, to keep the submitted version the final one. I'm confused. You're saying that the entries shouldn't be updated after the contest? They were updated after the other ones. Please explain. There is an official entry to the contest, submitted by the deadline. That should not be updated, of course. That's why contest versions are standalone and not played over the 'net. Oh, you mean updating them before the winners are announced? Think "speeding over the ocean's surface at 200 miles mer hour." And the options are, of course, the floating diamonds, which have 3 modes you can switch between with the A key: emergency defense, attack, and recharge player energy. Show general stats for pandamissile. I like. However, perhaps more variation is need in the environment and it's kinda hard telling where I am y-wise. Perhaps, a little bar showing your elevation is needed. This is pretty fun, and the hand drawn style sprites are looking great (looks better in the game than in the screenshot). I liked the way the options behaved, and the difficulty seemed good. Nice job so far, keep it up . Won't run on Vista, here. I'll try later on at home. edit: it runs, just can't grab the display. Had to kill some processes. Must be a known Vista issue. Ooh, ouch. I'll make a vista-compatible version in ZIP. the2bears: Game Maker games made on the 6.0 platform are compressed in a way that Vista can't display it, so we have to make an executable on the 7.0 one. Not sure I like the way the ship moves, it's just too... limited, but that might only appear so to me. Graphics are nice (I like the water), the options and absorption are interesting, boss is great. Keep up the work. I see. The lack of ability to move relative to the enemies... It's because they target points relative to the player. Perhaps I'll fix that. I hope everyone's getting to the boss OK, though surprisingly a lot of people are telling me it's too easy. Well I don't want to touch any demos till I'm done with mine, but I have to say I like the screenshots Nice Job. The lifebar is not empty, it decreases in length as you attack it. Dunno about killing it though, I sorta exited out after a bit. This game is great so far, but you need to have better-defined motion parameters. I couldn't really move very fast or very far, and if I held the absorb button(c) down, I couldn't die. The game basically felt like it was playing itelf. I had already planned to loosen up the player's ability to move relative to enemies and get rid of the absorption exploit. I've been hearing a few of these comments in different places, but thanks for the feedback. It helps a lot. Lots of potential here. I liked the water effects and the fast pace, but I have a couple of suggestions. The controls felt unresponsive. I could press Z and nothing happened. It seems like you have to hold it down to shoot, this is a bit annoying. The secondary weapon takes a long time to start firing - again this feels unresponsive. Finally, when you're underwater it's very hard to see enemy bullets. And believe me, it's gonna be a blast! Also the music is coming along very nicely. Only about 3 more tracks and it's all finished. The SFX are taken care of too. Show general stats for Teknogames. One of the level themes. In-game version is 16 bit 44100 hz (~320kbps) and loops. Nice theme. Also, the robot picture is worth using as an avatar, if you ask me. 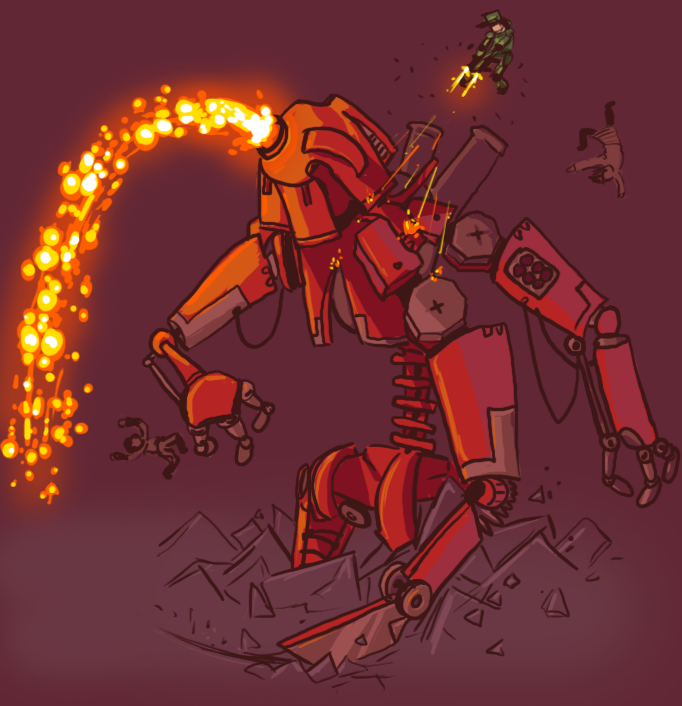 Teknogames, that lava spewing robot AXIS is so wickedly awesome!!! ! I LOVE IT... very original stuff and so SPLENDIDLY well designed, you know that!? d= =b ! And I personally welcome you to this Shmup-dev forumboard as well... enjoy yourself there and have some fun with us!!! ! !